The society was formed because it filled a need. Up until 1990 hockey buffs were researching and compiling information in isolation mostly unaware of the special interests of others. Their only networking was through the Hockey Hall of Fame in Toronto and/or the International Hockey Hall of Fame and Museum, in Kingston, Ontario. 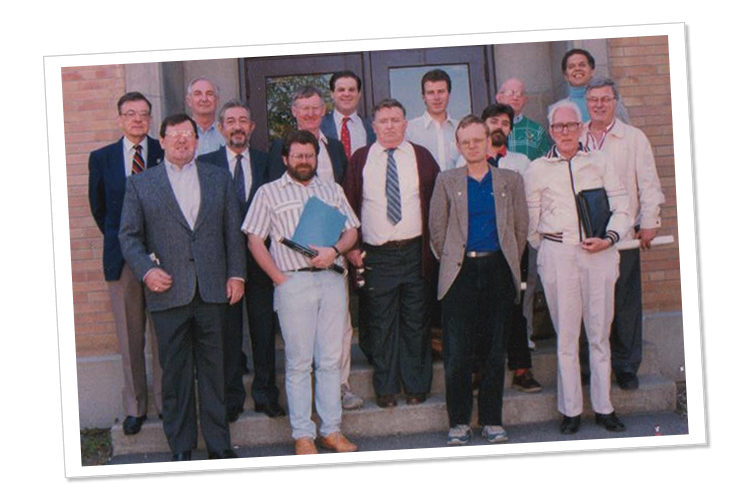 The scattered work being done on hockey history came together in 1991 when 17 members attending the Canadian Association of Sports Heritage met in special session at Kingston to found an organization dedicated to specific aims and the mutual benefit of members. The germ of the idea started in March, 1977, when Bill Fitsell, of the IHHFM, who was monitoring the Society for American Baseball Research (SABR), first proposed the idea of a Hockey International Research Society (HIRS) to Lefty Reid, Curator of the Toronto hall. Two years later, William Humber of Seneca College, who was investigating the planning of a Canadian Sports Research Conference, encouraged the idea of forming an independent hockey group. In 1980, Edward R Grenda, a colleague of Fitsell at the Kingston hall, joined discussions and applied for a search and clearance for a corporation (without share capital) to be known as the "Canadian Hockey Research Society." Second choice was "Hockey International Research Society." The general objects were: "To encourage and cultivate the study of ice hockey as an important athletic and social institution in Canada and other countries in which it was played." The idea continued to percolate through the 1980s and was given a boost by the combined support of Joe Romain and James Duplacey, then on staff of the Hockey Hall of Fame in Toronto, who had contact with several hockey aficionados. Enthusiastic international support came from William Martin of Oak Park, Illinois and the late Patrick Conway of Syracuse, N.Y. The impetus towards a formal organization came when Romain was elected president of CASH and Kingston filled the national organization's need for a meeting place for its annual convention. The founding meeting was tagged on to the end of of the CASH meeting and history was made. Fitsell chaired the inaugural session at the Kingston shrine and was elected president. The chosen name of the organization, on suggestion of broadcaster-writer Brian McFarlane was: Society for International Hockey Research (SIHR) with a "sur"-sounding acronym. Among the charter members - "The "Kingston 17" (the same number that founded SABR at Cooperstown, N.Y. in 1972) were representatives from three provinces (New Brunswick, Quebec, Ontario) and two states (Illinois and New York). In its fledgling year, the society membership grew to 29 and in its second year the roster of 52 could be typed on one page. Today it stands over 500, with members throughout Canada and the United States and from around the globe including, but not limited to, Hong Kong, Japan, England, Sweden, Slovakia, Australia, New Zealand, Germany, France, Italy, Finland, Austria and the Czech Republic. The SIHR-Plus Newsletter was established in the first year but was supplanted by the President's Bulletin. After President Fitsell was succeeded in the chair by Paul Kitchen in 1996, the Newsletter recovered its orginal name but continued under the same editorship. Today it is known as the SIHR Bulletin, and has been available electronically since 2006 and has also been translated into French since 2012. The organization holds two meetings a year; the Annual General Meeting in May and a fall meeting in October. Originally centered in the Toronto to Montreal corridor, locations have greatly expanded with events being held in both small and large cities in the Maritimes, Quebec, Ontario, Manitoba, New York, Minnesota, Massachusetts, Michigan and Rhode Island. The Hockey Research Journal, containing papers presented at meetings and articles submitted by members, was instituted in 1993 under the editorship of James Duplacey and subsequent issues were published in 1995, 1997,1999 and the annually from that point on. SIHR strives to uphold its main objective to promote, develop and encourage the study of hockey and establish an accurate historical account of the game through the years. Other significant accomplishments by its members include the authoring of a large number of hockey related books, involvment with several historical television and film projects, historically significant event and location commemmoration and general education about the origins and ongoing history of the game.